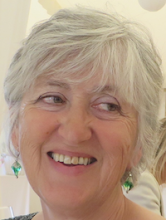 When I was six, I wanted to be a trapeze artist, and when I was 60 I wanted to walk a tightrope. 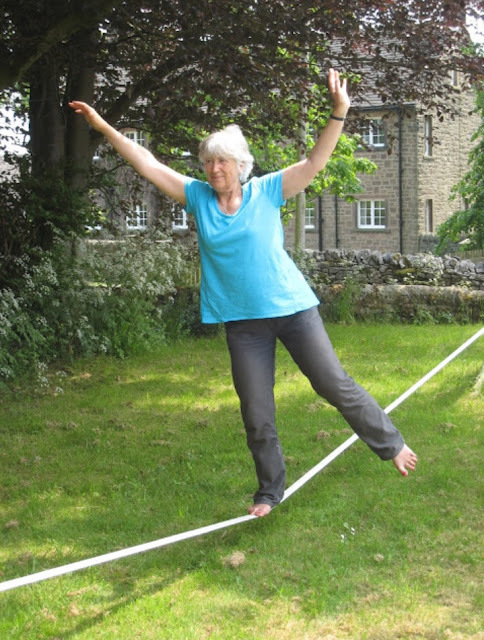 The nearest thing available was a slackline, so Zoe and family gave me one for my 60th birthday and Dave fixed it up on our front lawn with sturdy wooden posts and supports. I have been searching through my photos for a good picture of me walking on it, and this is the best I can find. Goodness knows why Dave likes to take pictures on the slant. It's really annoying. The slackline is in fact horizontal. This was some years ago, since when I've been spending more of my time outdoors on my bike than on anything else. The slackline has been neglected, and this spring Dave pointed out that after 8 years, the polypropylene band would be weakened by exposure to ultraviolet light and would be unsafe. We took it down, and I felt sad. I had only ever managed to walk half the length of it in one go - 13 steps - though I could balance on it on one leg for 20 seconds or more. Dave kept asking me when we were going to pull up the wooden posts that had supported it, and I kept saying - 'Not yet. I might buy another slackline.' 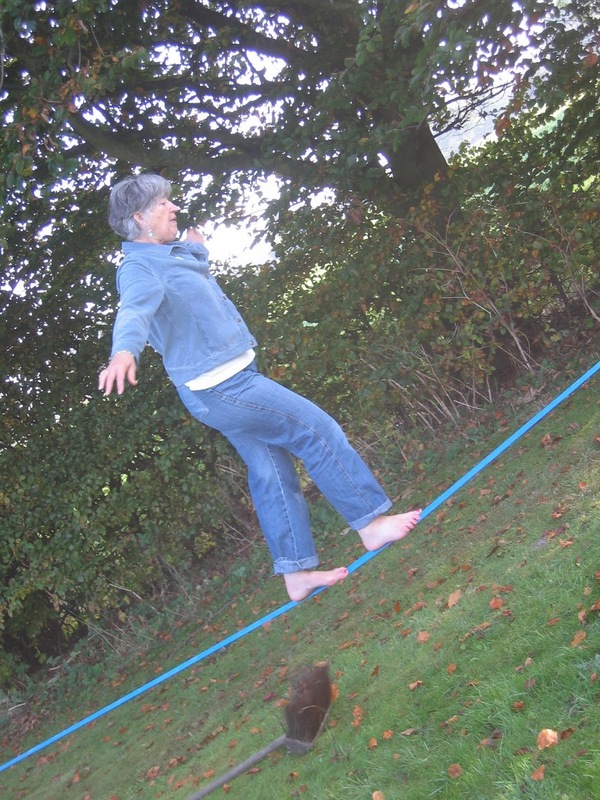 But last week I accepted that just as the back garden has needed remodelling to take account of decreasing energy and increasing bike rides, buying another slackline would be a waste of money. When he pulled up the posts, two of them snapped, so saying goodbye on safety grounds was a good call. Even so, letting go is hard. I’d love to go on a trapeze, but heights terrify me so the parachute jump is out, Helen. But thanks for the encouragement.